I love my eyes. And it's ok to say that. I feel like my eyes really show my happiness and joy. So why not make the most out of them! Right? I use to lightly line my eyes both top and bottom until... I hit middle age and decided I needed a softer look. I went to one of my favorite makeup counters and asked for some advice. At Laura Mercier, they showed me how to "tightline" my eyes, which I have now been doing for years. You can read more about it here. And you can buy the special brush and cake eyeliner here and here. The brush is a bit expensive but it will last for years. It took a bit of practice to perfect both but feel the look is much softer than lining above my eyelashes which I felt was too heavy especially for daytime. Still trying to brighten my eyes a bit I looked for another technique to accentuate and brighten my eyes. Many days, especially when I was traveling every week, I felt my peepers looked tired. I like this article that shares different ideas on brightening. Luckily, I found a white highlighter by Sonia Kashuk that works extremely well and you can buy it here from Amazon. There are many other brands that offer eye highlighters as well and I have linked them below in Instagram and LiketoKnow.it. My video below shows both tightlining as well as highlighting. I love both methods as it looks natural for an everyday look. And if you have blue or green eyes, it really makes your eye color stand out. If I am applying or freshening up my makeup for a night out, I usually freshen both areas and may pop some white highlighter in the corners of my eyes to open up my eyes even more. If you use some of the links provided, I may receive a small commission if you purchase the product. If you do... thank you... if not, hope you enjoyed my content. And if you recently joined me... welcome!! My goal is to share chic ageless style and endless fun, from a sincerely silver perspective. Including fashion, beauty, and relevant lifestyle information as we share this journey together! Thank you for reading my blog! Oh my! Thirteen days till Christmas! I feel like I am running out of time, do you? So happy that I can shop online, even though I enjoy the hustle and bustle of holiday shopping in malls, boutiques and my favorite stores. I mentioned in a previous post that Soft Surroundings asked me to choose some items, to share with my readers. You might remember the fabulous, faux fur poncho. Such a fun piece for the wardrobe!! Well, I got to pick three more items, and can't wait to share them with you! Truly, it felt like an early Holiday! The first item, I chose and highly recommend as a gift for anyone is this Lamb Wrap. Several years ago, my husband gifted me a neck wrap for neck and shoulder tension. So every night, before bed, I heat up the wrap in the microwave, wrap it around my neck and unwind. It has always been one of my favorite gifts. 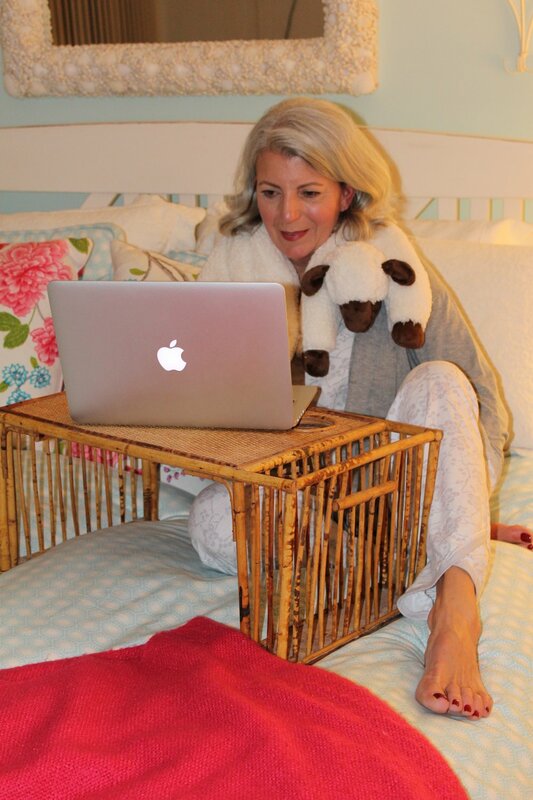 And this little lambie is so cute, and the aromatherapy is wonderful. This one can also be frozen. If you put this on your list for a loved one, I swear it will be a hit!! Next, I chose a holiday oil diffuser from Nest. If you love Holiday fragrances in your home and try to stay away from candles like I do, this one is simply the best. I actually gave this as a gift to my children's in-laws in the past and it was a favorite. Also, a great gift for the friend that has everything!! Last but definitely not least is my Cailyn O! Wow Brush. This is one of Oprah's 2017 Favorite Things and you or your friend will say "Oh Wow," once it's used. This brush provides a flawless finish when applying foundation and has won two beauty awards. The shape makes for even distribution. I love this makeup brush and feel you will, too! Hope this puts you a little closer to finishing your shopping. Soft Surroundings can really help you mark some items off that list via your local store or shopping online! I hope to hear back if you gift any of these items or just buy them for yourself. Tomorrow, I am headed out and braving the crowds. Wish me luck!! As always, thank you for stopping by and reading!! I so appreciate each and every one of you.